Where to find reloading equipment and dies? Redding Reloading Equipment is an American company through and through. They've been manufacturing a whole line of reloading equipment since 1946 on purely American-made machinery. Redding brings passion and excellence to the precision shooting community with the high standards they hold for themselves and their products. Redding's Type S Bushing Dies bring advanced reloading techniques to anyone with a standard reloading press. The design of Redding's Type S dies eliminates the problems inherent in resizing brass that does not meet the expected tolerances. These dies provide uniformity and concentricity to brass that would otherwise resize incorrectly. OTM Tactical has Redding Reloading Equipment at competitive prices. Whidden Gunworks views shooting as an art and seeks to improve and advance the world of shooting through scientific techniques. Their reputation speaks to their success in this area, as Whidden has proven itself to be an innovative and forward-thinking manufacturer whose products have consistently been used by winners of national competitions and world record-holders. Whidden's reloading equipment allows you to bring the national championship advantage into your own handloading workshop. With Whidden reloading dies, you can get the maximum potential from every round, increasing accuracy and precision to record-holding levels. With the pointing die system, you can cut down on drop and wind drift by sharpening the point on a bullet. This is just one of the advantages Whidden Gunworks provides. We're proud to carry low-priced Whidden Gunworks reloading equipment at OTM Tactical. 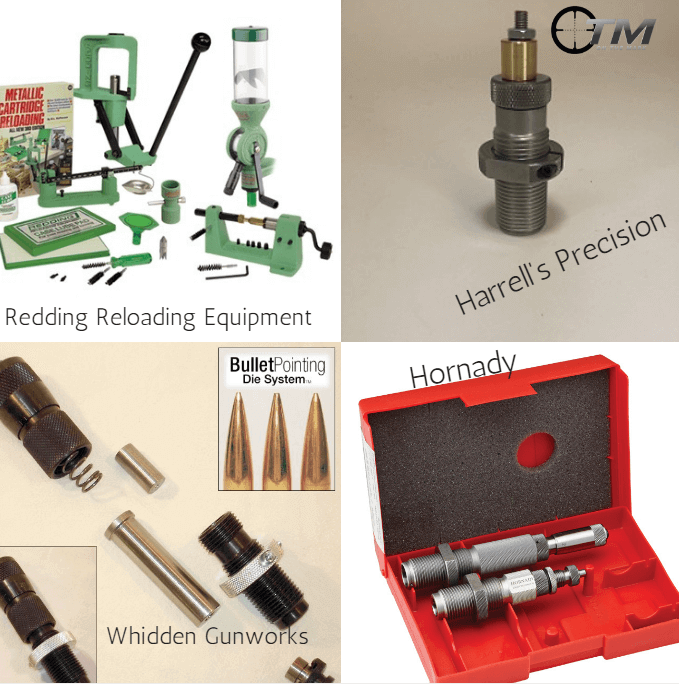 Harrell's Precision is a manufacturer of various high-quality rifle parts and accessories, including hardened stainless steel resizing dies. OTM Tactical is pleased to carry the Harrell's Precision 6MM BRA Full-length Resizing die at a low price. Hornady follows the philosophy of "Ten bullets through one hole" and their reloading equipment backs this up with unmatched precision. Their patented Lock-N-Load® technology represents the ultimate in quality for handloaded ammunition and gives shooters complete control over the ammunition they load with Hornady's system. Hornady Custom Grade Dies are machined under the highest standards to give you perfect results every time. Experience the ultimate in precision with reloading dies so well-crafted they carry a lifetime guarantee. Pick up your own set of Hornady Custom Grade Dies at a low price from OTM Tactical today. At On the Mark Tactical, we're a community of precision shooters from all walks of life, serving competition, hunting, hobbyists and more. We carry only the best rifle parts and accessories, reloading supplies, and more. We're also happy to help out with your questions, so please feel free to contact us.